Motto: "Pineapples! Rum! Corruption! Think about it..."
Tropico is a pristine, beautiful tropical island located in the tropics near Banana Republic. The tropical climate here is usually tropical. Warm tropical air blows in from the east, bringing in tropical rainfall and fresh tropical air. The tropical scenery and fresh tropical air are enough to make even the most money-laden Yanquis that happen to stumble into our houses of ill repute think they are in tropical heaven! To make matters wor- better, this tropical island is led by our wonderful tropical leader who we affectionately call, "El Presidente." Under his tropical leadership, Tropico has been a hot spot for tropical tourism, tropical agriculture and basic tropical industries for the last few tropical decades since he came to power. Despite the fact that his tropical peoples despite their universal love for him call for an election every five tropical years, he has managed to pass every single one, resorting to tropical fraud only twice (110% is downright unappreciative) and assassination of the opposing candidate once who died of natural causes. He is the best leader that the tropical island has seen since after he first took office and with recent advances in zombification rejuvenation technology, it will stay that way. For many years, the island was a pirate haven, specifically for pirates dealing in silk, feathers, kittens, and other soft-wares. This era didn't last long after the Pirate "Sid Meier" managed to sack the town and turn it over to Spanish rule. Under the Spanish, the island was a (tropical) backwater, filled with unescaped slaves, merchants and pirates who were too drunk to leave. It took until the 1950s that El Presidente started the first new modernization project on the island, rebuilding new farms and renamed new schools. This process slowed by construction delays due to the fact that by the time the workers had finally trudged their way to the opposite side of the island, it was time to go back home for a siesta. When the airport was finished after forty years of intermittent and incompetent construction dedicated skilled labor, tourism boosted the economy greatly. The Very Democratic Republic of Tropico is run under a very enlightened dictatorship. There are no elections, because the minions citizens like him so much, they feel no need to compete with him. As a result, the island has been under his enlightened rule for 50 glorious years. Instead of regular elections, annual coup d'etats are used to decide whether El Presidente will remain in power and this has become the islands national sport sponsored by both the CIA and KGB. This system works well. The rebels are usually citizens who do not understand or appreciate his greatness, and thus they often run off to the woods, only to be slaughtered liberated by El Presidente's loyal soldiers. El Presidente likes to spend money on beautification projects, especially erecting many statues of Tropico's national hero, himself. His palace is the most beautiful building on the island and will remain so indefinitely as all competition is subject to redevelopment into "El Presidente appreciation zones". His retirement home has not been decided yet(he is still mulling over rowboat options), but he has greatly assisted the citizens of Tropico in making generous donations to the El Presidente Charity in a Swiss Bank for that reason. We support him in this endeavor. We can't have El Presidente sleeping on leaves after he is gone can we? That's why we must do it instead. The island maintains steady relations with both the Soviet Union and the United States. Foreign aid money is often sent in an attempt to bribe us into an alliance with them. If you come to Tropico, even you can walk on water! We are close enough to get Yanqui tourists from America and also to base tactical and medium-range nuclear warheads for the Soviets. Hopefully this will keep us clear of international politics. The Tropican economy is a straightforward system primarily based on bananas, pineapples, and rum, where 13 bananas is 1 pineapple (except on tuesday pineapple specials), and 11 pineapples are worth 1 and a half bottles of rum, give or take. 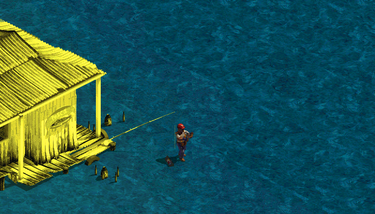 These also serve as the main staple in the diets of Tropicans. Exports include shoddily judiciously packed canned goods, ungrateful refugees, fast and agile political prisoners, and any bananas, pineapples, and rum not already consumed. Since our income largely depends on these last three items, we foresee no problems with the current population boom and degradation of arable land. There a mysterious ever-present music playing in the background at all times. Fortunately it is of good quality, so our priest tells us not to ask any questions lest god change the playlist.